Pangolins are slow moving, nocturnal creatures found across Asia and Africa but over a million have been taken from the wild in the last decade. The trade is being driven principally by demand for their scales, which are used in traditional Chinese medicine. Now the Cites meeting has agreed to ban all trade in eight species of Pangolin. However these scales, which the animal uses for protection, are one of the key reasons for their demise. In traditional Chinese medicine they are dried and roasted and used for a variety of ailments including excessive nervousness, hysterical crying, palsy and to aid lactation. As well as the scales, the meat of the Pangolin is eaten as bush meat in many parts of Africa and in China it has become something of a delicacy. The level of illegal trade is astonishing. Between January and September this year, authorities seized more than 18,000 tonnes of Pangolin scales across 19 countries, according to a study by conservation group, Annamiticus. The majority of these scales came from African pangolins in Cameroon, Nigeria and Ghana. Experts estimate that each kilogramme of scales requires the killing of three or four animals. It is believed that pangolins make up around 20% of all illegal trade in species. All pangolins are already listed on Appendix II but with a zero quota for Asian species. This has caused major problems say conservationists. "When pangolins are just in their product forms as scales or meat it's impossible to tell the Asian ones from the African ones," said Jeff Flocken from the International Fund for Animal Welfare (IFAW). 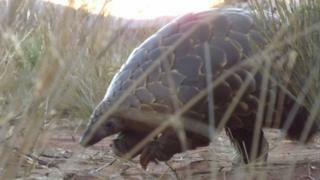 "Up to now all Pangolins were on Appendix II with zero quota trade in the Asian species, but what that allowed was a massive trade in African species and also enabled a whole mechanism for laundering Asian ones as African ones which are legal." Here at the Cites meeting, range state countries proposed that four species of African pangolins and four Asian varieties be up-listed to Appendix I meaning that all commercial trade would be stopped and greater protection demanded from law enforcement. There was widespread support for the move, with few dissenting voices. All over the large hall, stuffed toy pangolins could be seen on desks, indicating sympathy for the plight of this little known species. Indonesia objected to the up-listing of two Asian species, the Sunda and Chinese pangolins but the conference voted overwhelmingly to include them. "This is a huge win and rare piece of good news for some of the world's most trafficked and endangered animals," said Ginette Hemley from WWF. "Everyone wants this, law enforcement wants this," said Jeff Flocken from IFAW. "When they are listed as Appendix I there will be no mistake as to what's legal or illegal, because they will all be illegal. "This is a clear message from the world that the pangolins are in dire need of protection and we are going to try and make it happen."